A first defeat for the senior ladies. Battling against a gale force wind in the first half, the Down girls left themselves with a 9 point mountain to climb in the second half. They showed character and battled hard reducing the deficit, Orla Swail, Oonagh Lavery and Jessica Foy gave the Down girls fresh legs at half time but a strong defensive Wicklow team maintained the lead and held the ball well. A costly double sin-bin at the start of the second half for our goal keeper Aisling Cull and Jessica Foy, minutes after her introduction, left the remaining 13 players with work to do. In true form, the girls never gave up, battling right to the end. A tough but hard lesson for the young Down team which featured 6 players aged just 18. Our best wishes go out to our own Mairead Kavanagh who suffered a concussion during the second half. The girls have their first home game of the league, taking on Sligo in two weeks in Saval. Training continues this Sunday at St Colman’s College, Newry from 12noon – 2pm. 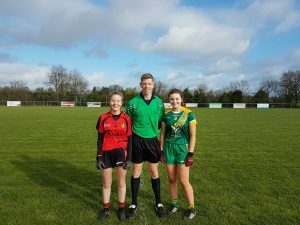 The girls travelled to Trim over the weekend for a tough game in tough conditions. The girls battled hard in the first half but found the strong wind a bigger obstacle in the second. Many positives to take from the game as we move closer to our first league game. Training continues on Wednesday and Saturday this week. The girls had a great weekend in preparation for the upcoming Ulster League, firstly getting together on Friday evening for a Pizza and Movie Night. Big thanks for the facilities and hospitality from Mayobridge GAC and the mothers of the Mayobridge players on the squad. It was great for the girls to get together away from the football pitch. They then followed this up on Saturday afternoon with a great pitch based session under the guidance of former Down mens senior selector, Jerome Johnstone. Well done girls. Best wishes on a speedy recovery to Katie Howlett, currently out with an ankle injury sustained against Tyrone. The U15 league gets underway on Saturday 9th March, with an away fixture against Monaghan. The girls training continues on Tuesday evening at 7pm in St Malachys. Challenge matches against Derry and Meath have been arranged for Sunday 17thFebruary. Further details will be posted during the week.